1. Referring to surrounding, bordering on every side, or around: Hayden and Jennifer were visiting Paris and the more circumjacent areas in order to learn more about France. 2. 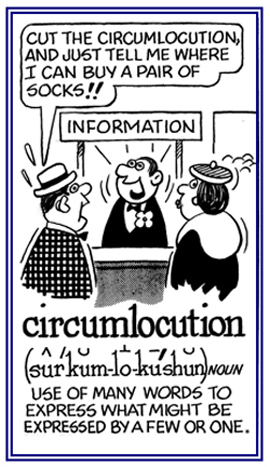 Etymology: from Latin circumjacens, circumjacent-; from circumjacere, "to lie around"; from circum-, "round, around" + jacere, "to lie". 1. The use of unnecessarily wordy and indirect language: A circumlocution involves the use of several or many words instead of one or a few of them. 2. An evasion in speech or writing instead of speaking or writing directly to the point: Mr. Hill, the principal, usually used indirect statements or circumlocutions when the teachers asked him specific questions about what to do in certain situations while teaching. 4. A description of a person who is using long words; especially, when verbal construction utilizing less amplification might represent a more naturally efficacious phraseology: Billy's use of circumlocution lengthened his report to his teacher; however, it resulted in his having a lower grade. Now, we are going to try vis medicatrix naturae* during your final days in the hospital. *. . . the healing power of nature. The noncircumlocutional title is, "All’s Well That Ends Well." Someone who uses excessive sesquipedalian terminology; that is, anyone who is unclear in his or her speech or writing. Characteristic of being roundabout and unnecessarily wordy. 1. A roundabout and unnecessarily wordy; rambling, meandering, verbosity, prolixity (boring verboseness). 2. An expression of something in more words than are necessary. Hobbes: How are you doing on your new year's resolutions? Calvin: I didn't make any. See, in order to improve oneself, one must have some idea of what's "good". That implies certain values. But as we all know, values are relative. Every system of belief is equally valid and we need to tolerate diversity. Virtue isn't "better" than vice. It's just different. Hobbes: I don't know if I can tolerate that much tolerance. Calvin: I refuse to be victimized by notions of virtuous behavior. —"Calvin and Hobbes" by Bill Watterson, January 2, 1995. Referring to someone who is using excessive language to evade a question, to obscure the truth, or to change the subject. Bright on every side: The circumlucid worm is easily visible at night. 1. A reference to revolving or rotating around the moon. 2. Characteristic of surrounding the moon. 1. Relating to the ability to sail or to fly around. 2. Pertaining to the capability of making the circuit of by navigation: The earth is a circumnavigable place if one has the right aircraft. 3. The possibility of going or maneuvering around: Ted had to find a circumnavigable way to get through the heavy downtown traffic. 1. To sail or to fly around something; such as, the world or an island. 2. To move around by walking, driving, etc. 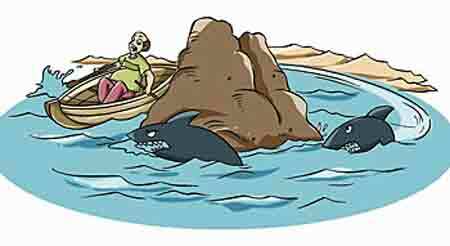 A man is striving to circumnavigate a stone structure in an effort to get away from the threatening sharks. 1. 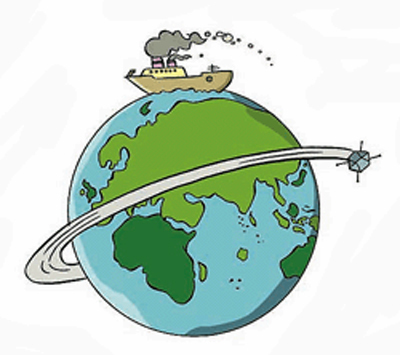 The act of traveling around something (by ship or plane). 2. Sailing all the way around something. 3. Moving around something in order to avoid hitting it. 4. A satellite or small body in orbit around a larger body; such as, the earth or another celestial body. Two examples of circumnavigation on the earth and in outer space. 1. Anyone who travels around. 2. A person who flies or sails around; such as, the world, an island, or other situation. Relating to an area in the sky that is full of clouds. 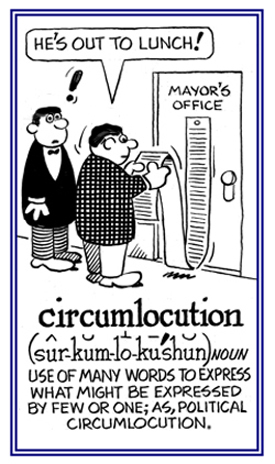 Related "around, round, surrounding" units: ambi-; ampho-; circ-; cyclo-, -cycle; gyro-; peri-. Showing page 4 out of 7 pages of 105 main-word entries or main-word-entry groups.